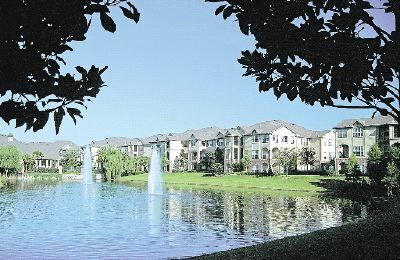 The Reserve at Pointe Meadows condominiums in Jacksonville, Florida. The Reserve at Pointe Meadows is a condo conversion project situated in the heart of one of North Florida's most exciting and prestigious new residential areas, close to a variety of employment, entertainment, shopping, dining and recreational destinations. The Reserve at Pointe Meadows combines unrivaled convenience with unsurpassed luxury and value, creating an exceptional lifestyle opportunity. This gated community features resort-style clubhouse, pool, fitness center, lighted walking path, basketball and volleyball courts. Alliance Company is the developer. 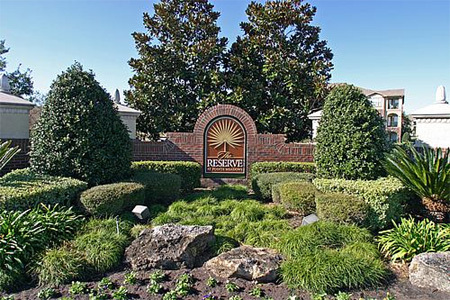 The Reserve's extraordinary array of private, club-style amenities makes leaving the community a challenge unto itself. Meet new friends at the aerobics studio and fitness center, with state-of-the-art equipment and cable t.v. Get competitive on our indoor basketball and volleyball court. Afterwards, cool off with a relaxing dip in our beautiful, resort-style pool with its sensuous curves, lush tropical vegetation relaxing waterfall and separate wading pool. The Reserve's one, two and three-bedroom condominium homes are exquisitely designed for a variety of lifestyles, with the common threads of distinctive architectural design, uncompromising construction materials and exquisite interior appointments. All residences at The Reserve at Pointe Meadows feature a gracious variety of standard features including open floor plans with soaring nine-foot ceilings; an abundance of windows that bathe interiors in natural light; elegant crown moulding and raised-panel doors; gourmet kitchens with exquisite ceramic tile flooring; energy-efficient appliances and raised-panel cabinetry; spacious master suites with large walk-in closets and luxurious master baths with oversized showers and garden tubs, perfect for soaking all of the stress of the day away. All residences at The Reserve at Pointe Meadows will have DSL phone capabilities or high-speed internet access; full security systems and smoke alarms; and extra sound insulation between residences to protect your comfort and privacy. Attached and detached garages are both available. Once you make your home here, you'll agree � The Reserve at Pointe Meadows provides the perfect combination of luxury and comfort, creating the ultimate Florida lifestyle. Choose from six different floor plans range in size from 905 to 1,424 square feet: The Avalon, The Bristol, The Covington, The Dunhill, The Essex, and The Florence. See site map.